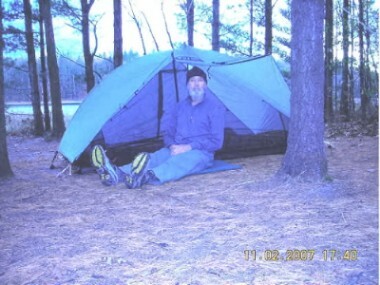 I started backpacking in 1979 with two weeks in northern Michigan along the Lake Superior shore. My gear was cheap, heavy and sometimes painful. Starting pack weight was 70 lbs (32 kg) with food but no water. Since that first time I have made one and two week trips in Michigan, Maine, New Hampshire and Pennsylvania. I am slowly reducing my pack weight. Starting the last one week trip in New Hampshire I carried 35 lbs (16 kg). I am slowly obtaining lighter gear. I am also occasionally switching to a hammock in warmer weather. Color choices are Dark Grey, Dark Blue, Light Grey, Red and white. The choices on the website are pictured, not described. The shirt is very soft inside and comfortable. The seams are all flat and smooth. The stitches I can see are around the collar, along the zipper and along the bottom of the shirt. These stitches are very small, straight and even. The shirt is not what I think of as bodyfit on my body. It fits me a little loosely. The Zip T is the most stretchy garment I've ever had on. I assume this is due to the 11% Lycra in the material. There are "instructions" on the back of the box, "Just wash it and throw it in the dryer". The washing instructions on the tag inside the shirt are different. "Wash separately before wearing. Machine wash cold with like colors. Tumble dry low. Remove promptly. Do not bleach. Do not iron." I had planned to go backpacking the day after the Solid Zip T arrived. Instead of reading any instructions I put the shirt on and wore it for 2 days and the night between. I wore it both as a base layer and over a merino wool shirt at different times on my hike. It worked well either way. I also wore it all night in my sleeping bag. As much as I roll and toss around the Zip T was very comfortable. The smooth exterior of the Zip T easily moved with me. The Zip T was comfortable under a windbreaker when the temperature was 50 F (10 C) to 57 F (14 C). When it started getting colder I needed the merino wool shirt also under the windbreaker to be comfortable. After wearing the Zip T for over 36 hours there was no detectable (to me) body odor. How durable is the Hot Chillys Micro-Elite Chamois? little heavier if I'm going out for over night. questions as I use the Hot Chillys Micro-Elite Chamois. October and April. When we do I just wear fewer layers. Chamois, including any problems I find. This seems to be a very comfortable base layer for cool weather hiking. It worked well for me in the sleeping bag on a cold night. This concludes my Initial Report. The Field Report will be added in about 2 months. I was able to get in one long day hike/work day on November 10th before traveling out of state to visit relatives. This hike was in the Manistee National Forest on the section of trail I maintain. This time I wore Hot Chillys Chamois Zip T for a base layer with a fleece shirt and a wind breaker over it. This was a cooler day with a high of 42 F (6 C) so I wore this combination all day, even when cutting and moving down branches off the trail. 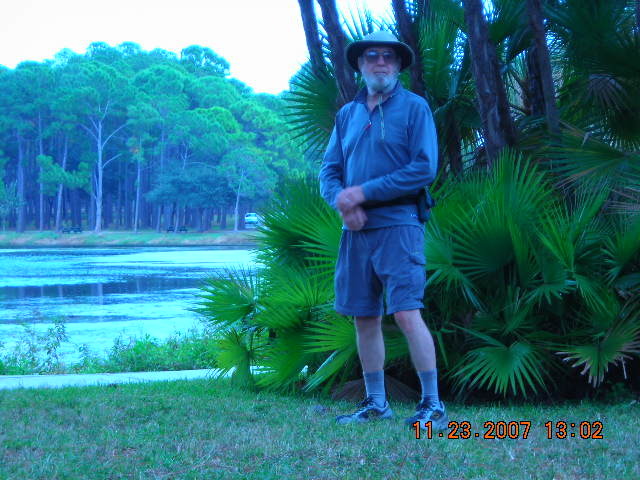 A 2 week trip to west central Florida in late November changed the terrain and weather of my testing of the Hot Chillys Chamois Zip T. I did get in several hikes while we were visiting the southland. My favorite was mostly along the Pinellas Trail up to Taylor Park. This is about a 5 mile (8 km) walk from where we were staying. When I took the above picture the temperature was a warm 83 F (28 C), which was typical for my hiking in that area. I've been skiing several times in the Pere Marquette State Forest on several different trail systems. The temperature has stayed generally a reasonable 25 F (-4 C) on these outings. 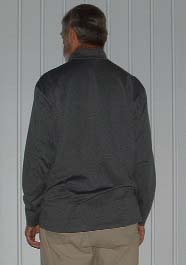 I've been wearing the zip T as a base layer under a fleece shirt with a waterproof Shell over all for a wind breaker. Since I am learning to use a new GPS I often stop to mark locations and check distances. I also went for snowshoe hikes twice in the Sleeping Bear National Lakeshore. The temperature was about the same but I was moving much slower and there was (as usual) a strong wind off Lake Michigan. I wore the new Columbia Dub Mountain Parka (both down liner and waterproof shell) over a light weight fleece shirt with the the Zip T as my base layer. During the first hike in November I was either walking fast or working. I got a bit sweaty at times and the inside of the waterproof wind breaker was wet when I got back to the truck. The fleece shirt was damp. The Zip T still felt dry to me - much better moisture control than I've seen before. The hikes in Florida showed me that the Zip T functions just as well for sun protection on warm weather conditions. It was more comfortable to me than the long sleeve polyester T shirts I've been wearing for several years. The Zip T fits me loosely and transports the sweat away easily. I think I've found a new shirt for summer hiking as well as colder weather outings. The Zip T did just as well on both the snowshoe and ski outings back home in Michigan. For several years, I have carried a dry polyester T shirt and a fleece jacket to change into for the drive home. Wearing the Zip T I have found that I can just change outer layers and still be comfortable with the Hot Chilly since it still feels dry. The Hot Chillys Zip T does a good job of transporting moisture to the outer layers. At this time I'm very happy with the Hot Chillys Zip T. I'm beginning to think it might be my shirt to wear year round. It has worked as well on several hikes in Florida temperatures of 65 F (18 C) to 85 F (29 C), summer weather to me, as it has in cold and windy conditions back home in Michigan. when worn as a base layer in colder weather it transports sweat away from my body so the shirt and I feel dry. The sleeves are just a little long for me, I would like to see a variety of light colors available, such as tan or light green. I would like to get another one in a light neutral color to wear on summer hikes. This concludes my Field Report. The Long Term Report will be added in about 2 months. I have worn the Hot Chillys Zip T at least 25 days hiking, snowshoeing or skiing in the last 2 months. The weather varied from warm and sweaty 38 F (3 C) down to a cool and windy -2 F (-19 C). Some trips were to the Sleeping Bear National Lakeshore along Lake Michigan. The elevation in this area varied from about 600 ft (183 m) along the lake shore up to about 800 ft (244 m) on some dunes. Most trips were in the Manistee National Forest (MNF), with elevations from about 800 ft (244 m) to just over 1200 ft (366 m). The rest of my outings were in the Pere Marquette State Forest, south and east of Traverse City, Michigan, with elevations about the same as the MNF. The majority of my hiking this winter has been off trail while exploring for trail reroutes in the MNF and the Pere Marquette State Forest. The Hot Chillys Zip T has been a comfortable base layer for all my outings. There have been times when it has been just a little damp under my arms. Most of the time the Zip T has just been sweaty wet on my back and underarms. When this is the situation I just drive home and then take off the outer layers when I get inside. I often leave the Zip T on because it still feels dry even when the next layer out is damp and sweaty. There have been several times, either due to weather or activity, that the Zip T and all other layers have been very sweaty wet. When this happens I take off all upper layers, including the Zip T, and put on dry shirt and jacket for the drive home. I hang the Zip T over the back of the seat on the way home and it is often dry by the time I get home. Whether I get sweaty wet or not depends on my activity and on the layers I wear over the Zip T. When I go skiing I get very sweaty regardless of the weather. Snowshoeing, for me, is a much cooler activity so I sweat very little. Walking (hiking) is the big variable. In colder weather, I can often control body heat by taking off layers as I get warm. In my experience the Hot Chillys Zip T is a very good base layer for all my cold weather outdoor activities. I think it is even better for hot weather, based on 2 weeks in Florida in November. With temperatures from 70 F (21 C) up to 85 F (29 C) I never felt sweaty hiking in local parks and bike trails. What I like about the Hot Chillys Zip T: it is soft and comfortable, it remains comfortable when wet from sweat, it dries quickly when I take it off and hang it up - sometimes it is dry hanging over the back of the truck seat on the way home. It just does not absorb sweaty body odor. I can wear the Zip T for 6 days and still no odor (on the shirt that is). The first few times I washed the Zip T I was very careful to follow all directions. Now I wash it about once a week and just throw it in with all my other hiking clothes. I don't wash it because it is dirty or smells bad, It just seems to me that clothes should be washed occasionally. I can detect no signs of wear. The Zip T looks just as neat and new as it did when it first arrived. What I do not like about the Hot Chillys Zip T: I'm looking hard to find something I don't like so I will just get picky. Most of the available colors are dark except for the white. 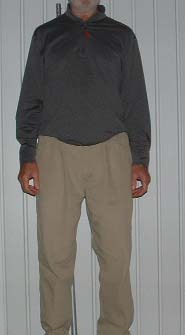 The dark black, blue, red, or even gray are fine for cold weather wear but a few light colors (tan or light green) besides white would be a nice addition to the line. I would like to wear the Zip T for backpacking in the summer and white is just not a good color choice for me. I tend to get my backpacking clothes dirty and very light colors seem to get dirty the fastest. These are just my preferences for summer colors. It is not sold in any local stores and now I want at least one more Hot Chillys Zip T.
Even though it is not my preferred light brown or light green I expect to wear the Zip T for most of my backpacking next summer. This concludes my Long Term Report. I would like to thank BackpackGearTest.org and Hot Chillys for giving me the opportunity to test the Hot Chillys Chamois Zip T.